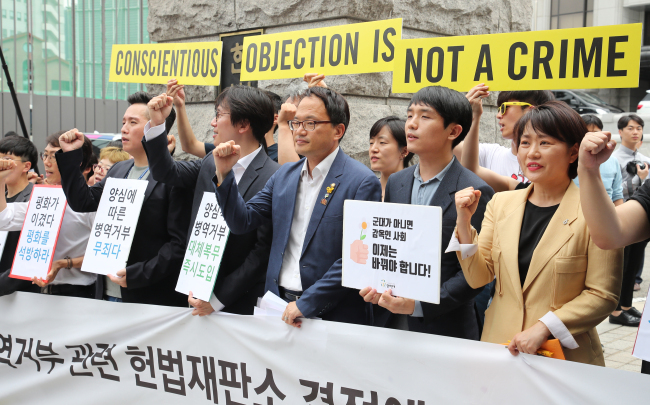 A South Korean conscientious objector was sentenced to a jail term Tuesday, despite the recent Constitutional Court order for the government to introduce civilian forms of service for them. In its ruling, the court said Oh’s motives are “unclear,” especially considering he is not affiliated with any religious organizations, such as Jehovah’s Witnesses, which prohibit members from serving in the military. In his statement submitted to the court, Oh said he had been deeply disturbed by the country’s military system and culture, especially after learning what had happened during the 1982 Gwangju Democratization Movement. Some historians believe that many anti-government protesters in Gwangju were bludgeoned, stabbed and shot by martial law troops. Oh said he is also against the way the Korean military has been treating sexual minorities, as well as its participation in overseas armed conflicts. “For such reasons, I refuse the draft,” he wrote. The sentencing clashes with the Constitution Court’s landmark decision last month, which ruled Article 5 of the Military Service Act unconstitutional, as it does not offer alternative services. The court gave the Moon administration and the National Assembly until the end of next year to revise the law. Oh said he plans to file an appeal. South Korea, still technically at war with North Korea, currently offers no alternative to the military service required of all able-bodied men. Refusing to join the military can lead to a jail term of up to three years. It could also severely hurt one’s career prospects, as most major firms here require all male applicants to share their military service status when they apply for a position. Since the 1950s, some 19,000 men have been arrested and jailed for refusing to serve in the military. The number is higher than all conscientious objectors jailed around the world combined.